With cloudHQ, you can set up a real-time backup of all your Dropbox Business accounts to Amazon S3, Amazon Glacier, or any other cloud storage service (Google Drive, etc.). Real-time data backup will automatically make a backup copy of every change made to your Dropbox files. This means cloudHQ is essentially capturing every version of your Dropbox files and saving them to Amazon S3. It allows the Dropbox administrator to restore data (or create a snapshot of your system) to any point in time. You can think about cloudHQ sync as very powerful version of Apple Time Machine. Of course, you can back up your Dropbox to not only Amazon S3 but also to a Box folder, Google Drive, etc. 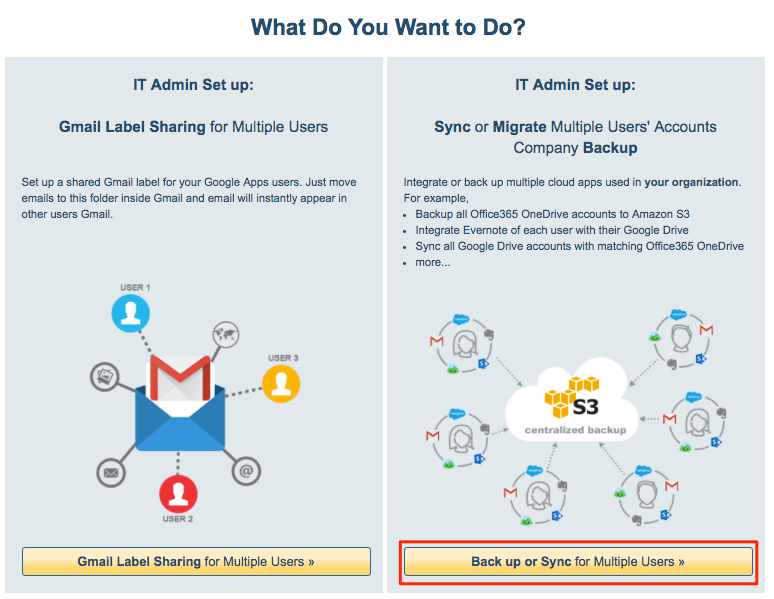 The instructions are pretty much the same – just select a Google Drive account and folder instead of Amazon S3. Ensure that you are a Dropbox for Business admin. Instructions are here: Dropbox for Business admin. Click “Finish” to create sync pairs and start the backup.